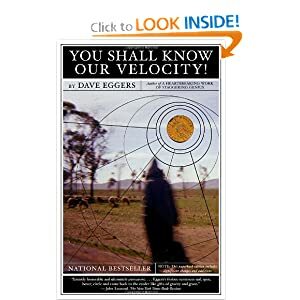 Dave Eggers, You Shall Know Our Velocity. This book is flying…thanks for the recommendation Tay! My London reading list, in chronological order. These are simply books that I have read, the ones I recommend are duly noted. The links will take you to Amazon where there are tons of reviews! Cryptonomicon, by Neal Stephenson, comes highly recommended by a good friend. At 988 pages (I had to look this up, a unique dliema on the Kindle), Cryptonomicon is an investment that is well worth the pay-off. The truth behind the story is fascinating, as are the crazy characters Neal weaves throughout the historical settings. Give this one a read if you dare..
Moonlight Mile: A Kenzie and Gennaro Novel, by Dennis Lehane. I’d say it was fun to fall asleep to; that isn’t saying much which is exactly what I am getting at. In this one, the characters that were so compelling in the same series were dull (note that the main dude quit drinking and womanizing – coincidence?). It is very rare that I put down a book without finishing it. I get it, this book is great. Unfortunately, the story isn’t. At least at this point in my life. The God of Small Things, by Arundhati Roy. The Lacuna is beautiful and challenging, well worth your efforts. And it is because it does take some effort to get through that large junk in the middle I do not recommend this book for everyone. She is wonderfully talented, and this story is incredible, just not one of her best. I recommend Skipped Parts: A Novel, by Tim Sandlin, which addresses extremely heavy social issues with a comedic flare that rewards you with each flip of the page. Not for your grandmother. This was a book that surprised me when I didn’t want it to end, and that is always a good sign. Free for Kindle users! I have picked up a few books by Dennis Lehane and have enjoyed them all. A Drink Before the War: A Novel is a good read – fun, fast, and fictitious. Nothing more, nothing less. Valdez Is Coming is both gritty and boring. Amazing dialog, as Elmore Leonard is known to produce, but holy tee-pee did the plot move like molasses on a cold day. I recommend The Eyes of the Dragon, per recommendation of Mr. Jimbo. Not your typical Steven King book – closer to Harry Potter than Pennywise, that is for sure – but nonetheless a fast and enjoyable read. Mr. King is simply a great story teller – and this is a story is one that is comfortable in your imagination even weeks after you finish it. I recommend Blindness (Harvest Book) (Paperback) (Jose Saramago): it’s different, and it is eyeopening (yes, that was intentional). I would save it for a trip where you have plenty of time to read – this is not a book you pick up for 20 minutes. It requires effort, but the time is well worth it. No, I did not read The Colorado Kid (Hard Case Crime #13) because of the cover. In fact, I didn’t even finish it, despite the cover. I haven’t read enough of Mr. King to appreciate his early stuff. Hence, I am now reading The Eyes of the Dragon. To say I was disappointed by Coyote Blue: A Novel would be an understatement. I’m a big fan of Christopher Moore, but this just doesn’t compare to Bite Me: A Love Story. Okay, I am slow on the uptake, and I am finally realizing that I recommend just about everything. But this book simply has an eye-opening pace that keeps you intrigued, if not baffled or saddened, from start to finish. Accordingly, I highly recommend for the fictionally curious, Slaughterhouse-Five: A Novel. If you are not fictionally shy and ready for a quick ride, I recommend Screwjack: A Short Story. My official review: holy crap. I would put The Picture of Dorian Gray on your list of books to read while on vacation. Totally get that the book was hugely controversial – it would be even if it came out today. Problem I had with the book was that it was my first book on my kindle – it was like reading in a bookstore, with option upon option within reach. Now that is tough reading! I recommend Those Extraordinary Twins by my favorite author. Laugh out loud funny and incredibly crafty, full of wit and surprise. An easy read on short flight, and best of all free on your Kindle. I recommend: The Guernsey Literary and Potato Peel Pie Society (Random House Reader’s Circle): A brilliant story comes to life through witty and heartfelt correspondence. No chapters to speak of, you will not want to put this down as each page is more addictive then the last. Treat yourself to a powerful piece of fiction! The Poisonwood Bible (Barbara Kingsolver): After reading The Bean Trees, I have to admit that my expectations were very high. In the end, the book was equally as beautiful, though more of a challenge to get through (it is written with five different point of views). I would start with the Bean Trees and if you have a nice long holiday, give this one a try. The setting in the Congo is breathtaking, as are the traumas that unfold in the Price family’s new home. The Girl with the Dragon Tattoo (Millenium Trilogy, Book 1) (Steig Larson): I know this isn’t going to sit well with many of my family members, but I just couldn’t get past page 250. I set it down, and do not plan on picking it back up anytime soon. Hunger Games Trilogy Boxset(Suzzane Collins): I have to admit, it took the first book to get me intrigued, the second to get me hooked, and the third to wonder if I should have been reading something else! An absolutely wicked start, though it drags a bit towards the end! I recommend The Wind-Up Bird Chronicle: A Novel (Haruki Murakami): There is a reason why the name Murakami is recognizable by many readers – he is a master at creating a different world. This story, though somewhat of a task to get through, is beautiful and imaginative. I believed the world he created, none of his craft seems to have been lost in translation! I’ve only read a few of these but your comments on the girl with the dragon tattoo (I got through it and the first few pages of the second book only because I’m incredibly stubborn) and the hunger games trilogy are totally spot on, which makes me want to read the books you give a good review to. Are you, perchance, on goodreads? Thank you for your comment and compliment! I am on goodreads, but to be honest I don’t do any review there. But maybe I should! I’d be thrilled if you read a few books based on my reviews…on the flip side, do you have any recommendations? Thanks again for leaving a comment! That is a fantastic list of books – looks like my list just grew by around 108! Thank you so much for leaving a comment, I really appreciate it. I will be sure to check in on you as your list grows!